Just around the corner, on Saturday April 26th there is an exciting little fiber festival. Color Fiber Festival is taking place in Berkeley and will include fiber tastings (materials fee only) and free drop spindle classes. Several local indie dyers and crafters will be there including yours truly. I am looking forward to browsing some Pigeon Roof Studios fibers – can you imagine how nice it will be to see a bunch in one place?! I am particularly excited that A Verb for Keeping Warm and Tactile Fiber Arts will be there. They have the NICEST naturally dyed fibers. I’ve spun up all of my Yak and I need more! You should definitely check out the session/class schedule – there will be fun things to do all day. I might sneak in there with a few weavette/weave-it demonstrations, and I’ll even let you give one of my looms a try! If you have an hankering for anything in my shop, let me know and I will bring it and you can pick it up! 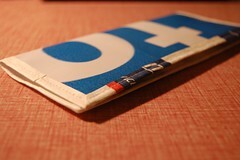 You can even get recycled vinyl wallets from Abmatic as she’ll be representing with me. Did I say how excited I am about this?? There is inside and outside space available so you can come and shop for fiber, hang out and spin, and even get lunch nearby! 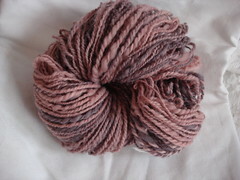 I hope I can sneak away to try out some fibers from Rare Wool Breeds. 4 Responses to "Fiber Festival Fun"
Ooohh! Youmake me so envious! Down here in Western Australia we don’t have such wonderous things as Fibre Festivals very often, and when we do they don’t really compare to the size and range of Stitches, or Maryland etc.. but I shall live vicariously through you Make sure you post lots of pictures!! How fun! I’m so jealous! I never remember to get in on Pigeonroof Studios updates on the weekends so I just drool over everyone else’s! YES! Thank you for posting this! I must be living in a cave as i hadn’t heard of this yet. I had actually just signed up for a drop spindle class somewhere else yesterday. Oh well, at least i’ll have SOME idea of what’s going on 😉 Thank you and see ya there! I really wish I lived out there – sounds like a lot of fun!